Enclosures may also be coupled together to form large control panels. 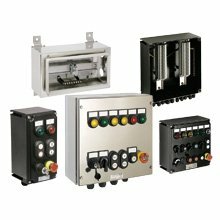 The enclosures are suitable for use onshore or offshore where light weight combined with a high level of corrosion resistance is required. Area Classification Zones 1, 2 and safe area. CSA Listed for USA & Canada. Certified Temperature: –55°C to +50°C.